Chemicals store energy in their bonds. If the products of a reaction store more energy than the reactants, then energy must have been taken in from the surroundings. The overall amount of energy, however, doesn't change (if this is a closed system) - we know this is true, because energy cannot be created nor destroyed. When reactions happen in solution, there are temperature changes that can be observed and can be measured using a thermometer. Energy is needed to break the bonds in the reactants to form their separate atoms. This energy is called the activation energy, and is an endothermic process. The newly separated atoms form new bonds to make the products, and release energy to their surroundings. This is an exothermic process. 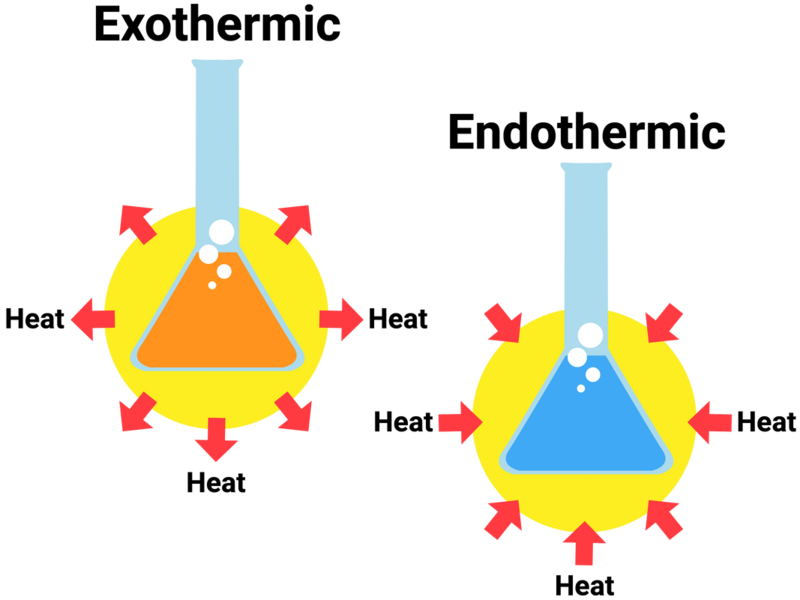 These are diagrams that show the relative energies of the reactants and products in a reaction - to show how energy changes over the course of a reaction. All reaction profiles start with an initial rise in energy, this is the activation energy and is the energy required for the reaction to begin. Whether the reaction then releases more (or less) energy than it initially required will determine if it is an exothermic or endothermic reaction. A reaction that releases energy can be shown on a reaction profile to initially have an increase (due to breaking bonds of reactants), but then has a bigger drop in energy overall (due to this energy being released from making new bonds). A reaction that takes in energy can be shown on a reaction profile to initially have an increase (due to breaking bonds of reactants), but then has a smaller drop in energy (due to bonds being made). Every chemical bond has a specific bond energy. Whilst the energies vary slightly depending on the compound, we can assume this difference won't affect our calculations. A bond energy tells you how much energy is required to break the bond. 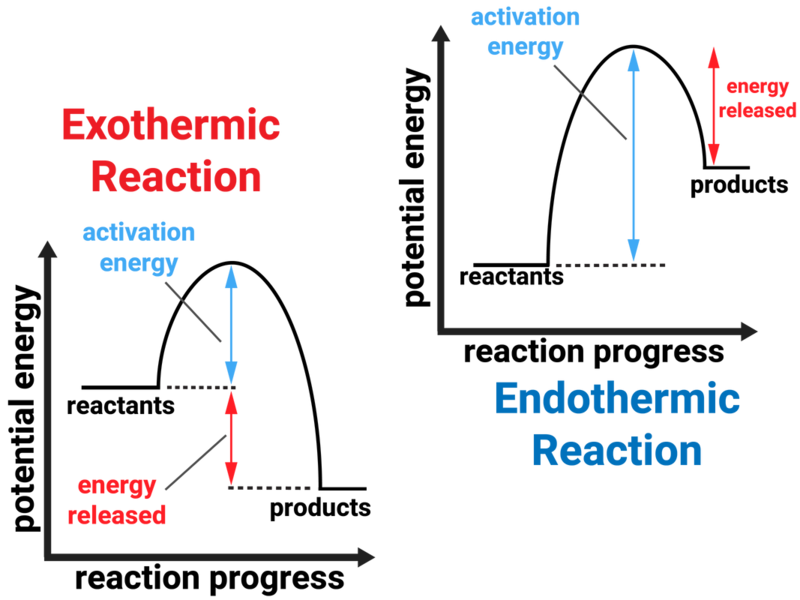 If more energy is required to break reactant bonds - the reaction is endothermic. If more energy is released by making product bonds - the reaction is exothermic. 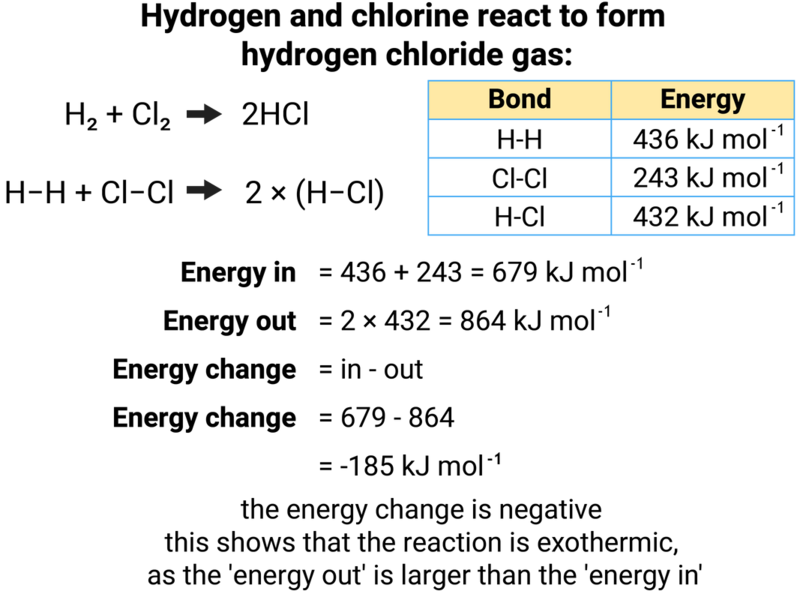 Some common bond energies are given in the table below. if you have a positive (+) value, then your energy change is endothermic; if you have a negative (-) value, then your change is exothermic.